One of the universal truths is that road construction is dependent on the materials at hand. At one time or another, almost every material common to an area has been tried by road builders. Roads of sand and clay are an example. 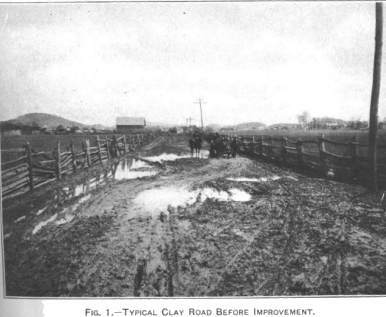 Sand-clay road construction was one of the common methods of providing a stable road surface in the early 20th century. 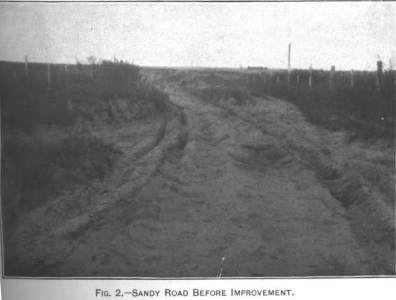 The idea was that adding clay to sandy roads gave them stability; adding sand to clay surfaces prevented them from rutting and becoming sticky in wet weather. Historian Albert Rose explained the tricky part of construction was getting the proper proportions of sand and clay so that "the clay acted as a binder while the sand particles were permitted to bear upon each other and interlock so as to resist displacement by traffic." With their economy depleted by the ravages of war, the South needed a road surface that could be built and maintained at a small cost from local materials in generous abundance. It was a logical development, therefore, that S. H. Owens, road supervisor of Richland County, South Carolina, because of his location and the thoroughness and efficiency of his work, should be acclaimed by his associates as "the father of the sand-clay road in America." Mr. Owens wrote, "In January, 1889, I took charge of the roads in this county, which were then in deep sand in two-thirds of the county, the balance, being through sticky clay hills with the exception of about two miles of macadam road which had proven too expensive for our county to continue to build. I commenced covering the sand on the old Camden road with clay, to about 10 inches in depth. At first the people were displeased. It had rained a great deal and they were not accustomed to seeing muddy roads. I continued to throw sand on the clay until it quit bogging and sticking to the wheels, keeping it crowned with an ordinary road scraper. After I had built a few miles of the road and it became smooth and hard the people were delighted." This sequence of events-mixing the material, interaction with rain, public dissatisfaction, followed by continued application of material-would prove to be common to sand-clay road construction. The U.S. Office of Public Road Inquiries/Office of Public Roads (two of its names during this period) disseminated information about construction of sand-clay roads where they were most practical--areas where frost did not penetrate the ground to any appreciable depth. The South Atlantic and Gulf States were especially suited to the technique. It must be remembered, however, that the great variation in the physical properties of clay makes it difficult to give definite rules, which shall be general in their nature, for the mixing and application of this material. It may safely be said that the construction of sand-clay roads in the Southern States has passed the experimental stage. It has been proved that they are well adapted for light traffic, and are less noisy, less dusty, and more resilient than the average macadam road. Even under heavy traffic they have proved to a great extent satisfactory. There are sand-clay roads in the South Atlantic and Gulf States over which heavy loads of cotton and other farm products are hauled through the year, with but little resulting damage. When the cheapness of this kind of construction is considered, it will be seen that for certain localities, at least, it is preferable to macadam. The Bulletin contained a series a photographs illustrating sand-clay road construction. Professor M. Goode Homes of the University of South Carolina's Department of Civil Engineering, explained how to build sand-clay roads in the April 1911 issue of Southern Good Roads. He made clear that considerable care had to be exercised during initial construction, but that the road would not be completed until cycles of traffic, rain, and the addition of more sand had occurred to consolidate the surface. In addition to ensuring proper drainage, the road builder also had to conduct regular maintenance to keep the road in shape. It has undoubtedly proven a success in many instances, and as a road of comfort to man and beast, its elastic surface has no superior. It is less injurious to automobiles than other roads, and in the matter of expense is less expensive in first cost and less for repairs. Ordinary sand and clay makes a better road than all clay or all sand because they have the tendency to overcome the bad qualities in each other. The sand renders the clay less sticky and clay overcomes the liquid character of sand. From this observation it might be concluded that any haphazard mixing of sand and clay would produce a sand-clay road, but no greater mistake could be made than to assume good results would invariably follow when the proportions used and the principal underlying the mixing is not clearly understood by the road builder. It is manifest that a certain definite proportion must exist between the sand and clay in order that the greatest neutralization of the bad qualities in the clay and sand may be obtained, and the resulting composition produce the best road. It is evident that a deficiency of clay would leave the sand predominating and resulting road excessively sandy. Likewise a deficiency of sand would leave the clay without support ready for rain and travel to produce a muddy road. But in all cases the grains of sand must be in contact in order to give rigidity to the traveled surface when the clay becomes softened by rain. Furthermore this contact relation must have sufficient depth to support the loads to be hauled over it. It is evident, therefore, that the road must become exceedingly muddy from top to bottom and from side to side before uniformity of mixture is possible. This is a most critical period in the construction and the stoutest-hearted road builder often loses hope and courage and feels that he has made an utter failure, when he should know and the public should know that this is his opportune time to effect and really is effecting the contact mixture. During this period, the road builder had to determine if more sand was needed, but could do so "only by observation and experience . . . by closely watching the manifestations." Because the initial mixture was rarely perfect, the road builder had to adjust it "through the puddling process" that usually took one or two years. Often, "the road becomes well nigh impassable during this puddling period." Another key to success was the quality of the clay. Clays that withstood heavy rain without erosion held the sand in place, while clays that melted and became liquid when water was applied became slush when it rained while in dry weather they would form dust, leaving the sand loose. The road builder, therefore, "will require greater knowledge of the clay that of the sand." It is plain, then, that in order to build a road sufficient for heavy traffic that the depth of sand should not be less than eight inches when applied to a clay road bed and great care should be taken to make the application of sand at a time and in quantities sufficient to take up the softened clay as fast as it appears on the surface. When it is desired to build a sand-clay road on a clay foundation and it is impossible to wait for rain to soften the clay, the surface may be loosened by plowing it and harrowing the sand into it; but before the road can in any sense be called a sand-clay road it must pass through the puddling process and very often the road-builder will discover that he has an excess of clay and will require more sand when the first application disappears. The remedy is to continue adding sand as long as the clay is in excess. The judgment of the court was that I must put the road back like it was before and it was so ordered. In the opinion of the court, it was best to choose the lesser of two evils. The old road was bad and the new one was much worse. Another feature of the judgment of the court was that I should put the road back as I found it at my own expense. Watson reported that, despite the order, he never did a thing to the road. When it dried after the rain, the road was in fine condition--and still was years later when he relayed the anecdote. On February 21, 1917, the U.S. Department of Agriculture issued Bulletin No. 463, Earth, Sand-Clay, and Gravel Roads, by Charles H. Moorefield, Senior Highway Engineer with the renamed Office of Public Roads and Rural Engineering. He reported that the public roads in the United States (excluding roads in incorporated cities and villages) totaled 2.5 million miles, with earth roads comprising 89½ percent (2.2 million). Of the earth roads, sand-clay roads amounted to a total of 44,000 miles (nearly 2 percent), mainly in the South. Comparing these results with earlier surveys, Moorefield concluded that "it is evident that the construction and maintenance of earth roads will continue to be of considerable importance in connection with every comprehensive plan of public road improvement." Moreover, because sand-clay and gravel surfaces "often constitute the first steps from earth roads toward the more highly improved surfaces," they would remain important for years to come. No matter what method is followed in constructing a sand-clay surface, traffic usually must be depended upon to puddle and compact the surfacing material, and the road never should be considered complete until after it has been subjected to traffic for a considerable period. During this period the surface should be kept in shape by repeated dragging, and if necessary additional sand or clay should be supplied at points which show weakness owing to these materials not having been mixed in proper proportions. After the first soaking rain, plow and harrow the surface again until the surfacing material practically becomes mud, after which shape up the surface and keep it in shape by repeated dragging until it has dried out and is thoroughly compacted. Watch the road carefully for several months after it is first constructed, to correct deficiencies of sand or clay and to keep the surface in shape. During the first decade of the 20th century, the growing importance of the automobile made old ideas about highway surfaces obsolete. Surfaces that had been ideal for horses and wagons were destroyed by automobile tires. Harder, more durable surfaces, namely asphalt and concrete, were soon to overtake earth, sand-clay, brick, gravel, and other surfaces that had dominated the first two decades of the Good Roads Movement.